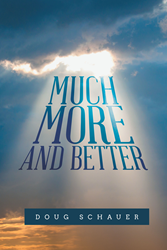 Recent release “Much More and Better” from Page Publishing author Doug Schauer is a comprehensive, chapter-by-chapter Bible study focusing on the Holy Spirit as revealed in the Book of Hebrews. Doug Schauer, a former senior pastor at Arising Christian Church in Friendship, Wisconsin, has completed his book “Much More and Better”: a detailed study of the Book of Hebrews in Scripture. Published by New York City-based Page Publishing, Doug Schauer’s book is an invaluable resource for those desiring a deeper acquaintance with and understanding of the Book of Hebrews. Readers who wish to experience this illuminating work can purchase “Much More and Better” at bookstores everywhere, or online at the Apple iTunes store, Amazon, Google Play, or Barnes and Noble.